This wonderful hive called UAE draws people from across the world and creates a productive, thriving community. This was in evidence during the soft launch of a fusion honey by Singaporean Wirradiah Abdul Latiff. It started me on a sweet exploratory journey a week or so ago. After sampling the brand’s fusion honey — which is wonderful — I do some digging on the backstory. The young mother of four kids is 37 years old. What started her on this path as an entrepreneur was what she describes as “the miraculous effects of the Yemeni Royal Sidr Doan Honey in the treatment of cancer” for her mother. Intrigued, Wirradiah decided to research the healing properties of this honey, and that led to the launch of Shifa. What she found was a slew of know-ledge about the ancient Sidr Tree — also known as Lote, Nabkh or Christ’s Thorn Jujube. It is also mentioned in the Quran and is held sacred by many cultures — with many reputed medicinal properties. Sidr tree honey was also used by ancient Greeks, Egyptians and Romans. Wirradiah lists the ingredients in the artisanal product: it’s blended with Royal jelly, bee pollen, propolis, black seed, ginseng, ginger and cinnamon — these are all natural products that are recognised to have healing properties by different cultures in the world. Together with husband Roy, she says, “Royal Sidr Doan honey from Yemen is significantly superior to the Manuka honey of New Zealand.” They are happy to share the results of lab tests conducted by experts from SGS, a leading inspection, verification, testing and certification company, to support their claim. The couple are active members of the local Beekeepers Association UAE. I meet Zahira Nedjraoui, founder of the association, who started the Facebook group a year ago, in May 2017, inspired by her father-in-law’s 40-year-old hobby of bee keeping, in Berlin, Germany. Now about 50-member strong, the association has monthly meetups and they also organise other events. People are drawn to them out of curiosity or even a peripheral awareness about the importance of bees in the ecosytem. Nedjraoui at first found it very challenging to find information on beekeeping in the UAE. That’s why she thought about creating a platform to collate and provide information to hobby- as well as professional beekeepers, and possibly work toward common goals. Last weekend provided the opportunity for a handshake between members of the association and two professional Emirati beekeepers, Nahar Alameri and Ahmed Almazroui, who are now also members. The oft-quoted Einstein statement that if bees die out, the human race will follow in a matter of years may not actually have been articulated by him. The thought though, is vital — bees are the most efficient pollinators on the planet. Some weeks ago, an early morning call from a neighbour in Dubai, Shohreh, turned out to be a request to send my gardener across. Shohreh explained that the beautiful date palms at her villa needed to be pollinated and the season was getting on. We needed to hurry. Man with stepladder despatched, I paused long enough to wonder about leaving this business to the guardians of pollination — honey bees, I mean. The unregulated use of pesticides has decimated bee populations across the world. The Middle East is no different. Colony Collapse Disorder, bee-loving mites and pollution are other disasters, although the biggest one is a lack of human intelligence combined with apathy. A number of queries that the Beekeepers Association receives are from people who want to know where they can access raw, local honey. The primary mission of the Association is educational and environmental. They run classes for students, organise talks in schools, and thanks to social media, are able to safely remove hives or swarming bees from private gardens. 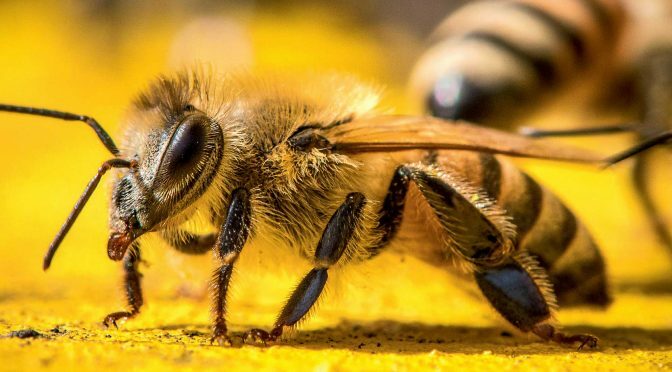 To this end, the municipality has been pressed in, as have pest control companies and property management agencies where SOS calls are likely to first go when people spot a hive on their balcony or garden. It’s a good sign that on many social groups, when someone puts up a panicky post, at least one response will come up, saying, ‘Don’t hurt the bees — do check out beekeepersassociation.ae for help.’ And volunteers will go across and remove the bees ethically, without killing them. There is actually no comprehensive database of all the professional beekeepers in UAE and where they are located. It’s a young industry, still establishing itself. Earlier, there would have been a tradition of hunting for honey from wild bees — in the mountains, typically. There is work on at the moment to develop a sustainable strain of bee that is adapted to the local climate. The queen bee rearing station in Al Ain is one such. Currently, many of the bee populations are imported from Egypt, and the local beekeepers find it easier to import new swarms than to help sustain the hives through the punishing summer months. The taste of monofloral honey is preferred in this region. Which is why the Sidr honey and Samr honey find particular favour here. One challenge for local producers of the Sidr honey is that damas trees flower at the same time as the Sidr is in bloom. While challenges define the milestones of a journey, the most powerful learning on my honey story, has been that of community. It is inspiring that out of a transient population, a community can grow that works to nurture, educate, and protect nature. And when those people begin to spread roots within the local community, you could say that’s sweet — almost as sweet as honey.